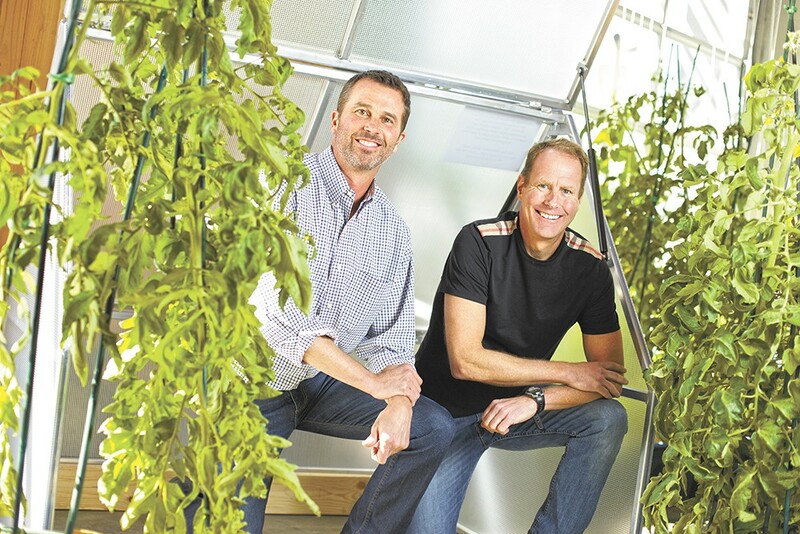 Toolbox co-founders Andy Barrett and Tom Simpson inside a super-compact Omega Hot House System. Ever wished you could just leave your Christmas lights up year- round? Or grow vegetables on your apartment balcony in the winter? Thanks to a group of Spokane innovators at the Toolbox, you soon will be able to. The Holiday Lights project is the brainchild of a group of Gonzaga University and Whitworth University students. The lights use less electricity than traditional holiday lights, are so low profile they can remain up all year and — best of all — can be programmed to twinkle in any color combination. It's the sort of idea you have and share with your friends. Usually, that's where it ends. Most of us lack the tools, knowledge and resources to bring innovative products out of our minds and into reality. The Toolbox bridges that gap, offering the expertise and infrastructure to help crazy ideas become tangible products. It's a manufacturing accelerator and an incubator for ideas for sustainable future living. When you walk into the 7,500-square-foot industrial building nestled along East Spokane Falls Boulevard in the University District, it's hard to tell what's going on. It's hard to even know where to look. The high-ceilinged, loft-like space is a veritable wonderland of curious objects. Tomatoes and cucumbers wind up ropes to the ceiling. Fancy louvered shades reflect sunlight into the space. Huge tables made from cross-laminated timber panels that could soon revolutionize the high-rise building market in our state jut across the room. From a back corner, a maze of blinking lights and circuit boards and wires beckons. Upstairs, people lean over mysterious projects, completely engrossed. The Toolbox is strategically positioned amid the makers and learners and doers who occupy Spokane's McKinstry Innovation Center. Founded by Berg Manufacturing Company Chairman Andy Barrett and venture capitalist Tom Simpson, the space opened in February and currently hosts a variety of sustainable products that will soon hit the market. "Andy and I have been friends for a number of years. He's always been kind of a manufacturing guy," says Simpson, whose success has been in the intangible product sphere. "We thought: What if we combine these things we've been doing independently and put together an incubator for companies that are producing a tangible product?" Barrett and Simpson vet companies for development, then provide the tools, space and support to bring their favorite ideas into the real world. Both men are intense and exude a contagious energy. Their space provides an opportunity for innovators working on different projects to find out how their products work together. Right now they're experimenting with a smart daylighting system that combines Vestis' Architectural Sunshade Systems with Spokane lighting manufacturer Ecolite's smart LED lighting panels. The louvered sunshades bounce sunlight indoors; the Ecolite panels dim or brighten, based on the amount of sunlight entering the room. Outside of this environment, manufacturers would be testing these separate products on their individual merits, but at Toolbox they can see how they'll work in a house or an office. The Omega Hot House System Greenhouse already is a success. The McKinstry Innovation Center has one overflowing with basil and peppers on its back porch. One of the small A-frame structures sits outside Central Food in Kendall Yards. A vertical, year-round gardening system involving ropes and pulleys is further out but showing promise.